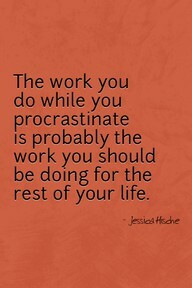 I love this maybe because the one thing I love more than my work is to procrastinate by doing other work! Confusing? See, I’ve got KidsArt, which is my official ‘work’, and when I’m bored of that I can paint or sculpt or write, all of which can also be categorized as ‘work’ – painting and sculpting falling into the paying kind of ‘work’ and writing falling into the keeps me from going crazy kind of ‘work’. To wrap it up, what I think this really means is that now I have TWO wonderful ways to avoid the things I’d rather not do. Brilliant, if I do say so myself! Seriously! You are brilliant and I dig that about you!